I just want to put in a foreword. 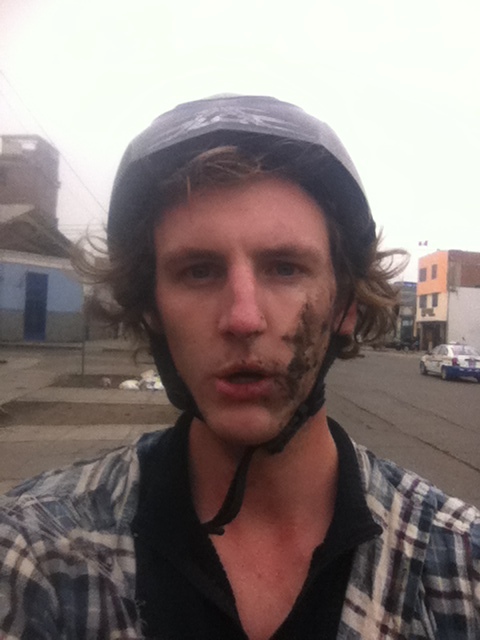 Peru & Lima are super friendly places. The average tourist would never come anywhere near an experience like this. I feel safer in the tourist districts of Lima than in almost any other city. Everything I am about to describe was completely avoidable (And will hopefully avoided in the future). I think any city has its bad people, bad places; rich gringo foreigners should be more careful to avoid these. This is the second time in South America someone has tried to make off with my stuff, the first back in Chile in January; luckily once again, their plans were foiled. 28 de Julio, independence day here in Lima, figured it would be a good day to check out central Lima, I hadn’t been there yet. Jumped on my bike and away I went. It’s a bit of a ride, bout 12 km, Lima’s roads aren’t the friendliest places for bicycles (understatement) so generally I pick my way through less busy streets. With a vague sense of which way I should be going, I pick my way down random streets until I hit my target. I like the randomness, and seeing where I end up, what I might find. Made it to Central mid afternoon, it was pretty busy. Balloons, ice cream and fried doughy sweet stuff, delicious, what more do you need? Toured around the city center for a while, lots of big old buildings and people being festive. It was nice. Lots of streets were closed off to cars, but this didn’t make cycling any easier; they were just jam packed full of people. Left central, explored some other areas over the far side of the city. One nieghbourhood seemed a little sketchy, so I didn’t dwell there. Made my way back through Central, set my bearing for San Borja, home sweet home for this month, and started picking my way back. A few minutes after. Slightly shaken. Cruising along, wind in my hair, it was all good. Maybe even got some ‘no hands’ action in to take a break from hunching over the handlebars. As I swiftly rolled down a small one way street, something in the back of my mind was telling me maybe it wasn’t the best place to be; but I was rolling along fast, and it was a very quite voice, it didn’t really have time to plead its case. There were plenty of people up ahead anyways, you don’t get mugged on a busy, neighbourhood street in broad daylight, right? A crew of skaters over there, some dude selling emoliente (hot fruity/herbal tea mixed with Aloe) over here, I’m pretty sure there were some parents and kids scattered around too. I picked and weaved my way through the people scattered about the street; some skater punk made a gesture at me like ‘Nice bicycle man, your super cool’ (Maybe he had seen my no hands cycling a couple of moments earlier). Dodged around him, and kept on going. At this point I realised that it really wasn’t an optimal street to be cycling down. A couple of metres later some guy made out like he was going to jump in front of me, i think he might have kicked my front wheel sideways as I was slowing to avoid him. Another guy simultaneously grabbed me and pulled me off my bike. They were trying to force me onto the ground; already half falling off my bike, it wasn’t hard for them to put me on the ground. What followed can only really be described as a scuffle. On my way to the muddy concrete road as they tried to get me down, I somehow had one of them in a sort of headlock. I felt the other going for my pockets. And then I was on the ground. I let go of the first bloke, and started yelling, swinging and thrashing about. Trying to keep them out of my pockets. AYUDARME! AYUDARME! (Help me, HELP ME). I really like that that word was taught in one of my audiobook Spanish lessons, way back in January. I wouldn’t say I was fighting, because there wasn’t enough thought in it. But they were on top of me, and I was thrashing about, flailing fists and yelling for help as though my life depended on it. It felt like a long time. I must have yelled ‘ayudarme’ at least 10 or 12 times, at the top of my lungs. It felt like minutes I was down, but in hindsight, it was probably less than 30 seconds. I guess the fact that I struggled so much, and that i made as much noise as I humanly could scared them off. Or maybe in all the noise and commotion one thought that they had already gotten the goods, so he ran away and then the other followed. Either way, they bailed; running into a nearby shop/house. I jumped up, looked around and found around 20 pairs of eyes on me. I stood there for a couple of seconds, dumbfounded. One skaters looked at me and said something. I’m fairly sure he told me to run. Picked up my bike and bolted, pedalling as fast as I could straight back up that street to the busy main road which lay only 300 or 400m away. I stopped caught my breath for a moment and wondered which way I should go. Down the main road, stopped again and wondered where I was, and which way I should go. I knew where I wanted to go for sure, I just didn’t know how to get there. Which streets were safe? I asked a couple which streets they thought were most safe. Minutes later I found an open park, with police in it. I told an officer what had just happened, I think he asked me if I wanted to make a statement. I declined, i still don’t know if this was the right or wrong thing to do, or if it really matters either way. Obviously it was a bad, bad neighbourhood, for them to attack me in broad daylight, with so many people present. I decided with only the mud on my face, and the rips in my flannelette shirt to show, the police probably had better things to look into. That combined with my broken Spanish, it would be pretty difficult for me to describe much of anything. I asked the officer which way was safest for me to go the remaining 6 or 7km home and set off. How was I so lucky? How did I just escape that with all my belongings still intact? Phone, Wallet and the most valuable item there, my bike. No blood, not hurt, all good aside from a slightly sore left hand, (not sure what that was from…..) a couple of scratches (probably from rolling around in the mud) and some fairly substantial rips in my flanny. I was ridiculously lucky. The rest of the ride home was probably the scariest part of my whole day. The actual event only lasted a couple of minutes, too fast to think about it, and I would have been running on adrenaline. The ride home I had plenty of time to think and worry about where I was going. Is that guy a potential robber/ Am I going the right way? I can’t take my phone out to check, cos the thieves might see my phone and attack me for it! I made my way home, safely. I guess next time I head out, I will be more careful. A tall, white gringo riding around the suburbs stands out like a sore thumb here. I will probably confine my cycling to my area, the neighbourhoods I know, and sticking to the streets I know are good. If I want to go to Central Lima, I will probably take a bus and skip this kind of possibility completely. A little older, a little wiser, no damage done. I will also try to get all my work done here a bit faster. The sooner I can let myself head back to the mountains and the river, the better. Why am I in Lima anyways? Working on the core of my project, getting a few key things done which require me to be here in person to meet with others. I have met with a few people from environmental groups, others involved in kayaking in Peru; all are super valuable contacts if I want to be successful in this project. There’s a bunch of other research and computer based work I am trying to plow through, I could in theory do that from anywhere, but the reality is that without a good internet connection and with so many beautiful rivers to paddle and mountains to climb, it probably wont get done. So ill be here for another couple of weeks. Project is coming along well, it’s really taking shape. Minor setbacks with seasons, water levels and timing and a couple of other things mean I might be in South America longer than originally planned, but that’s ok, there’s worse places to be. Ben I do not often read how you are going. This blog opened my eyes. What an amazing adventure you are on but boy you are one lucky person. So glad you are alright .